This remote land in northern Canada has a spectacular arctic landscape that attracts adventure travelers. It is the leading destination for adventure travelers. This park, located in southwestern Baffin Island, is noted for its impressive mountain peaks. Rock climbers and base jumpers love the vertical-drop cliffs, which are as high as 1,200 meters (4,000 feet). This destination in northwestern Baffin Island is also popular with adventure travelers. The area offers pristine peaks, fjords and glaciers while the sea coast is home to whales and polar bears. 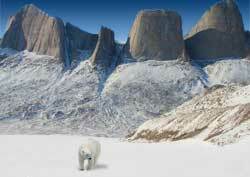 Baffin Island is 1600 kilometers (1000 miles) long and is the world's fifth largest island. It has a population of about 10,000. Most residents are Inuits. Two-thirds of Baffin Island lies north of the Arctic Circle. Consequently, that segment experiences 24-hour daylight around June and July and 24-hour darkness around December and January.